Stress, how can we overcome it? It is well-established that stress can be bad. No one wakes up in the morning wanting to be stressed. However, we can’t avoid stress in life, and it can have an impact on romantic relationships. Research has shown that when people get stressed out, they usually focus on themselves. For example, during conflict, when a person is stressed, he will only see his side being right, which could make it very hard to compromise and can strain a relationship. But this only paints half the picture. Sometimes people are able to bounce back from stress, which is known as resiliency. In fact, there are a lot of inspirational stories in the media of everyday people overcoming stress. Take for example, a victim of the Boston Marathon bombing; this particular runner lost her leg in the vicious attack. Sure enough, the next year the runner was right there at the starting line. So what gives? This certainly was a stressful event, but instead of crumbling under the stress, she was resilient. This begs the question: how can we build resiliency with our partners? Researchers believe the key is to have a 5:1 ratio of positive to negative experiences. Therefore, for each negative experience you have with your partner, you need 5 positives to balance your relationship out. Many experts suggest that it is not big moves in relationships that bring about changes in this ratio, but rather, small changes that can make a big difference. This is good news because when we are stressed, it can be hard to incorporate big changes in our relationships. Researchers have found two solutions to increase couple’s experiences: one you can do with your partner, and the other on your own. First, one to complete with your partner. Relationship expert Dr. John Gottman’s presents this five hour exercise to increase marital happiness and enhance resiliency. These suggestions are not meant to be completed all at once, instead, these are little things you can do that add up over time! For more information see the book: The Seven Principles for Making Marriage Work. Even when you are not with your partner, there are things you can do to strengthen your relationship and personal well-being. Although it might seem obvious, you can make your relationship resilient on your own by reflecting on the good in life. Just like when we eat our favorite foods, we want to savor it; the same can be done with our relationships. Scientists in the field of positive psychology discovered that even thinking about certain events can release the same hormones as when the event actually happened. For example, if we think about stressful events, we are more likely to have the same physical responses that cause us to feel tired and on edge. The same holds true for positive events. During your day, try to associate a song, picture, or even a movie with positive aspects of your relationship. For example, something that reminds you of your first date, or the time your partner surprised you at work with your favorite dessert. When you savor these memories, it will help you think of the good times in your relationship and help you relive these emotions and promote resiliency when stress does occur. Of course we will never be able to eliminate stress from our lives, but what we can do is strengthen the relationship we have with the most important people in our lives so that we can face stressful experiences successfully together. 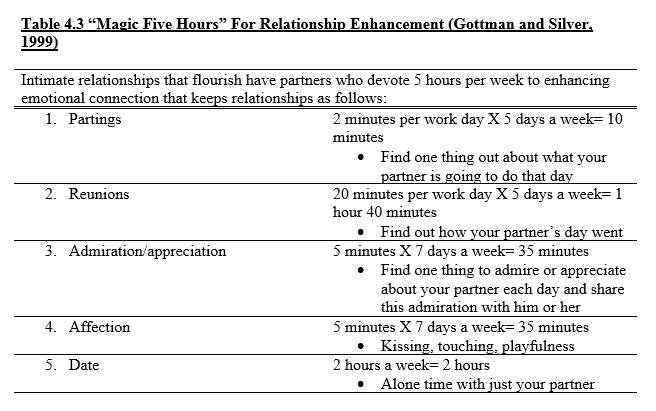 Gottman, J., & Silver, N. (2015). The seven principles for making marriage work: A practical guide from the country's foremost relationship expert. Harmony. Lyubomirsky, S. (2007). The how of happiness: A new approach to getting the life you want. Penguin. Neff, L. A., & Broady, E. F. (2011). Stress resilience in early marriage: Can practice make perfect?. Journal of Personality and Social Psychology, 101, 1050-1067. Todd, A. R., Forstmann, M., Burgmer, P., Brooks, A. W., & Galinsky, A. D. (2015). Anxious and egocentric: How specific emotions influence perspective taking. Journal of Experimental Psychology, 144, 374-391.